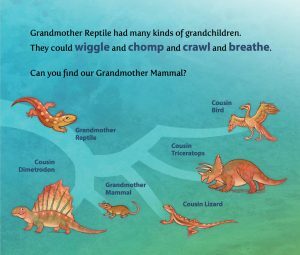 Please ask for Grandmother Fish: a child’s first book of Evolution at your favorite bookstore. Grandmother Fish is a child’s first book of evolution. 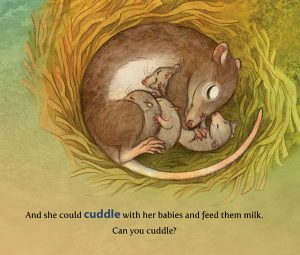 The book engages a young child’s imagination with sounds and motions that imitate animals, in particular our direct ancestors. It lets children see for themselves that we are related in form and function to the nonhuman animals that came before us. It’s the story of where we came from, told so simply that a preschooler can follow it. Wiggle like a fish! Hoot like an ape! The Macmillan edition is now available. Michael Kinsell of Michael’s Storytime reads the entire story with all the art. Our Kickstarter video is a great overview of the book and the team. This video shows you a read-through of the book with three parents and their kids, who are hearing the story for the first time. For just the highlights, see our Highlights Video. Karen Lewis, the artist, has a lot to say about science illustrations for kids, the Grandmother Fish project, and more. Grandmother Fish has received some great reviews. “A dynamite job…gorgeously illustrated.” NPR, 13.7: cosmos & culture. In her review, Barbara J. King refers to an earlier review by Stephanie Keep of the National Center for Science Education, who says Grandmother Fish is “heads and shoulders above any evolution book for children that I’ve ever seen”. We received a good deal of support early on, back when the book was still in sketch form and the text wasn’t final. Get ’em young, by PZ Myers. June 9, 2014. Our first coverage online, two weeks before launch. One-line tweet, by Daniel Dennett. June 23, 2014. This tweet was a big help on launch day. Granny, What a Big Extended Family You Have!, by Eric Meikle, of the National Center for Science Education. June 24, 2014. Eric helped me a lot with the science in Grandmother Fish. Evolution Book for Young Children: Grandmother Fish, by Greg Laden. He also helped me with some of the science details. Plug on GeekMom, by Samantha Cook. She has good taste in evolution books for kids, and she likes Grandmother Fish. Google+ post, by Fraser Cain, July 1, 2014. Here are some endorsements that came in directly. —Steven Pinker, one of the world’s foremost writers on language, cognition, and human nature, bestselling author of How the Mind Works and Better Angels of Our Nature. —David Sloan Wilson, a leading figure in evolution, editor-in-chief of Evolution: This View of Life, manager of various evolution programs, such as The Evolution Institute. Grandmother Fish Can Wiggle and Chomp? by the grandfather of creationists, Ken Ham. He says I’m aggressive. Is your grandmother a fish? by Georgia Purdom. July 10, 2014. A review on Ham’s website Answers in Genesis. 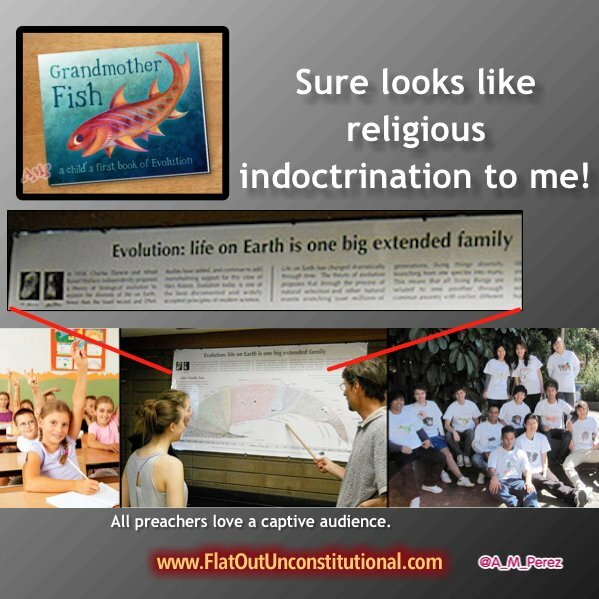 Darwinian Indoctrination for Kids, a video slamming Grandmother Fish and evolution advocate PZ Myers. Grandmother Fish got incorporated into a creationist meme. Here are people who helped make Karen and me make Grandmother Fish as good as it is. Our thanks to all of them.